Customize designer patterns to meet your personal décor tastes. Easily edit the color and size of designs. Our easy-to-hang, removable wallpaper allows you to express yourself in countless different ways. It's the perfect choice for apartments or dorms and other walls where you need a wall covering that is easy to remove. 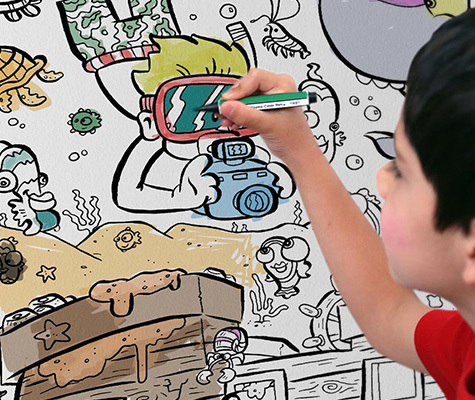 Click here to browse our Removable Wallpaper Collection and Coloring Wallpaper Collection. Your wallpaper will look and adhere best when applied to clean, smooth, and dry indoor walls. If you’ve recently painted your wall, we recommend waiting at least 30 days before applying wallpaper to allow the paint time to fully settle. Our wallpaper can also be applied to other smooth surfaces including glass, metal, and sanded wood without lacquer as long as they are in temperature-controlled environments. Each panel is 24” wide by 48” long (or 2’x 4’) and covers 8 square feet of wall space. To determine how much paper you’ll need, first measure the height of your wall(s) in inches that the paper will be going on and divide that by 48.” You’ll need one panel for every 48” or amount in between. We recommend dusting your wallpaper or spot cleaning with a dry cloth as necessary. Scrubbing or using water on your wallpaper will create blemishes or tears in the fabric and is not recommended. Canvas On Demand is not responsible for any damages due from cleaning wallpaper.